Australian batsman Aaron Finch will join the Auckland Aces for their crucial HRV Cup semi-final clash with the Wellington Firebirds tomorrow. 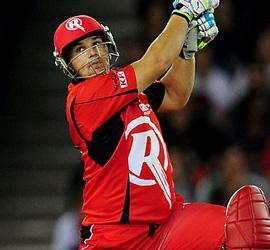 Finch comes fresh from the Big Bash League where he captained the Melbourne Renegades to the semi-finals. Their loss in that game against the Brisbane Heat has been to the Aces advantage as it means he is now available for tomorrow's match and the final if the Aces win. Finch has an enviable Twenty20 record, averaging 38 overall and with over 1600 runs in 54 matches. He's also played a handful of games for Australia in both twenty20 and one day formats and comes off a Big Bash season where he posted his first ever T20 century and racked up 332 runs at an average of 66.4. Aces coach Paul Strang is excited about having Finch in the mix for tomorrow. "He's a class player and he's obviously been in really good form for the Renegades so he'll be a great addition to the team. We're looking forward to him continuing that form when he pulls on an Aces shirt." Finch will be the Aces second overseas professional alongside Andre Adams with Englishman Phil Mustard having been released to take up a contract in the Bangladesh Premier League. The Aces squad also sees one change from that which downed the Stags to make the semi-final, with Grafton batsman Dusan Hakaraia joining the 13 to replace Anaru Kitchen, who suffered a side strain during that game and is still injured. The Firebirds are likely to have their own Australian firepower for the semi-final probably in the shape of Shaun Tait and Cameron Borgas, however Strang is making sure that his side is concentrating on their own game ahead of tomorrow?s match. "They're obviously quality players that they're bringing across but we won't be focusing on them. We've very much got the approach that if we get our own game right and nail all the details then we'll build the pressure that will win us games - and that's what we'll try and do tomorrow."